Emotiva has added two new multichannel amplifiers to its XPA Gen3 line of modular amps. The XPA-9 and XPA-11 are ideally suited to power an object-based Dolby Atmos or DTS:X speaker system. The XPA-9 consists of five 300-watt single-channel amplifier modules and two 65-watt two-channel amplifier modules, while the XPA-11 features three 300-watt single-channel amplifier modules and four 65-watt two-channel amplifier modules. Each amp uses a high-efficiency switch mode power supply (SMPS), independent, fully discrete, dual-differential, high-current, short signal path Class AB amplifier modules, and Optimized Class H power supply topology. Both models are priced at $1,999 and are available now. Emotiva Audio Corporation now offers two new variations on its configurable XPA Gen 3 modular amplifier. The new XPA-9 and XPA-11 Gen3 amplifiers (both priced at $1,999) are, respectively, nine- and 11-channel versions of the latest generation of Emotiva power amplifiers, embodying the exceptional performance of the company's top-of-the-line X series of electronics. Both variations are designed for maximum flexibility when powering an advanced home theater system with Dolby Atmos. Emotiva Audio's new XPA-9 Gen 3 amplifier is indicative of the company's attention to accuracy and overall technical performance. Featuring five 300-watt single-channel amplifier modules and two 65-watt two-channel power amplifier modules, the Gen-9 is the perfect amplifier to power a Dolby Atmos 7.1.2 or 5.1.4 system, let alone a seven-channel system with a pair of smaller speakers in a second zone. The XPA-11 Gen 3 ups the ante with three 300-watt single-channel amplifier modules and four 65-watt two-channel amplifier modules, giving consumers the ability to power 7.1.4 or 5.1.6 Dolby Atmos systems. 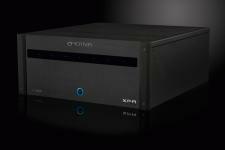 "We created two dedicated similarly priced versions of our modular [XPA Gen3] amplifier to satisfy demand from customers who are anxious to upgrade to a world-class home theater with Dolby Atmos," said Dan Laufman, President and CEO, Emotiva Audio Corp. "The XPA-9 and -11 are world-class amps that are true to our company ethos to provide impeccable quality with remarkable value for the investment." All XPA Gen 3 amplifiers share the same chassis and power supply; fully modular construction means that any XPA G3 amp can be upgraded by up to seven channels at another time. Each channel combines Emotiva's differential input, fully complementary, short signal path Class A/B amplifier circuitry, and Optimized Class HTM power topology, to deliver both true audiophile sound quality and high efficiency. Emotiva's high-performance universal switching power supply delivers exceptional efficiency and excellent low noise performance, automatically adapting to any line voltage between 100V and 250V, and reducing overall system weight for easier handling and installation. • Visit the Emotiva website for more product information. • Emotiva Airmotiv T1 Tower Speaker Reviewed at HomeTheaterReview.com.